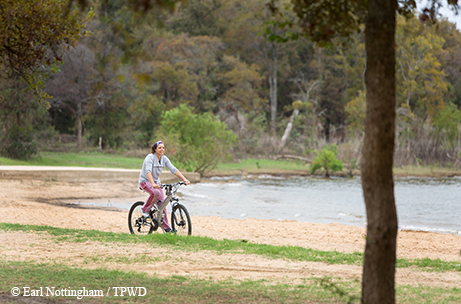 ﻿﻿﻿﻿﻿﻿﻿Johnson Branch offers hiking, biking and fishing on Ray Roberts Lake in North Texas. When the work week drags and the traffic snags, nothing sounds better to many Dallas and Fort Worth residents than escaping to a nearby park. Just over an hour away from the DFW Metroplex, the Johnson Branch Unit of Ray Roberts Lake State Park is the perfect outdoor destination for those who want to reconnect with nature, whether it’s for a week, a weekend or just an afternoon. The lesser-known of the two main state park units on Ray Roberts Lake, Johnson Branch is located on the north side of the lake near the small town of Valley View. Never heard of it? Don’t let the lack of notoriety fool you; Johnson Branch has a cornucopia of outdoor activities for visitors of all ages and interests. Recently ranked 31st in the nation for bass fishing by Bassmaster magazine, Ray Roberts is a popular fishing destination for all kinds of anglers. Launch your boat from the rarely crowded ramp at Johnson Branch. Perhaps you will reel in a record-breaking bass — the current largemouth bass lake record is 15.18 pounds. Bringing some first-time anglers with you? Between the tackle loaner program and the fully stocked Kid Fish Pond, Johnson Branch is a great place to catch that first fish and get hooked on the sport. This picturesque pond sets the scene for a fishing experience you and your young ones won’t soon forget. Love the outdoors, but not a big fan of worms and slippery fish? You can explore more than 12 miles of hiking trails at Johnson Branch, including three miles of paved trail. Explorers may be serenaded by the ka-ka-ka-kow-kow-kwop-kwop of the yellow-billed cuckoo, delighted by the bright red and green flashes of a male painted bunting flying from tree to tree or bathed in the sweet smell of Chickasaw plum blossoms. Don’t be surprised to find a nine-banded armadillo foraging along the trail. If you prefer to do your trail exploring on two wheels and at a much more exhilarating speed, the mountain bike trails at Johnson Branch have your name written all over them. The trails range from beginner to expert, providing challenges for all mountain biking skill levels. With just over nine miles to explore, you’re bound to be busy all afternoon. Situated in a blend of three distinct eco-regions (Eastern Cross Timbers, Blackland Prairie and Grand Prairie), Ray Roberts Lake State Park offers a unique natural experience. More than 300 plant species grow here, including towering post oak trees, delicate milkweed flowers and tall, slender prairie grasses like little bluestem. Looking to camp at Johnson Branch? Choose from walk-in campsites or water and electric sites for tents or RVs. Many of these sites have either direct water access or views of the lake. With the recent summer flooding, the park was closed for most of the summer, and it reopened to limited use in mid-September. Ray Roberts Lake is at capacity, with plenty of water for swimming, fishing and boating. Picnicking, bird watching and a large variety of ranger-led programs are also available. No matter your interests — birds, bugs and mammals or kayaking and fishing — there is sure to be a program you’ll want to attend. Call ahead to check on conditions and activities before visiting. The Johnson Branch Unit is located between Denton and Gainesville on FM 3002, just seven miles east of Interstate 35. For more information, call (940) 637-2294 or visit tpwd.texas.gov/rayrobertslake.